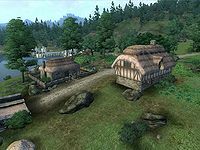 Weye is a village with an inn west of the Imperial City (quest-related). It is the first town that you encounter after leaving the Imperial City, located at the west end of the main bridge to the city. The village contains only two buildings: fisherman Aelwin Merowald's house and the Wawnet Inn, operated by Nerussa. Deepscorn Hollow: Deepscorn Hollow is an asylum for the wicked, a refuge from the persecution of the virtuous. Go Fish: Help Aelwin contribute to his retirement savings by obtaining the scales from some Rumare Slaughterfish for him to sell. A Venerable Vintage: Nerussa would like you to collect six bottles of a rare wine for her. Despite seemingly being part of the village, the Wawnet Inn has its own separate map marker. Weye was probably originally intended to be the site of the Chestnut Handy Stables, as evidenced by both the fact that the Chestnut Handy faction is set to own the house of fisherman Aelwin Merowald and the fact that the x-marker reference outside the building is named 'WeyeStablesEast'. This bug is fixed by the Unofficial Oblivion Patch. Esta página foi modificada pela última vez à(s) 21h43min de 6 de outubro de 2014.